Though we are a small organization, the MCM League is committed to the preservation and celebration of mid-century history, architecture and lifestyles in our community and beyond. We seek out projects based on fluctuating criteria that includes our capabilities, donated resources, and the urgency of the subject. 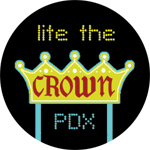 Crown Motel sign restoration — The Crown Motel on North Interstate in Portland was recently demolished for new development, but thanks to the efforts of the MCM League, the beautiful neon sign was preserved and is currently undergoing restoration. North Interstate Neon Corridor — In July, 2008, the city of Portland created the North Interstate Neon District. It provides special incentives for the route’s historic signs to stay in place or move to a different spot in the district, and new neon construction is encouraged to compliment older signs. Alyssa Starelli, former MCM League President, was instrumental in this move, and envisions Interstate becoming a popular historical corridor where restored signs can be sited and enjoyed by generations to come. MCM League online presence refresh — We are constantly working to refresh and refine our website, and to build our social media assets. We recently added a Facebook fan page and Twitter feed, and are continuing to find new and better ways to interact with our members and fans. New member welcome kits — In order to bring more value to paid membership in the League, we’re creating new member welcome kits, which will be sent to all new members, and to all current members who are up-to-date on their dues. These kits will come in nifty League logo totes, and will include items to help you get the most of your membership. Crown photo courtesy of Vintage Roadside.